They want autonomy under a new constitution ensuring a federal union with Kiev. 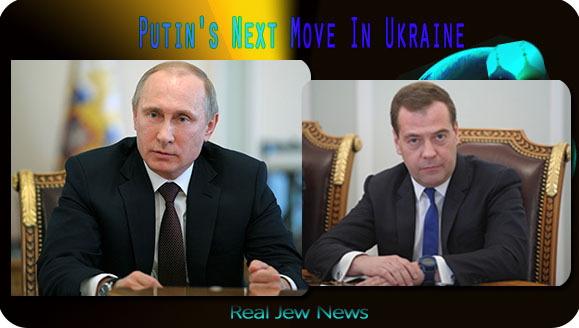 Does Putin want war with International Jewry’s globalized army known as Nato? No. But if Putin is pressed due to violence against Russians in eastern Ukraine, he’s on record that he will use military force if a diplomatic solution isn’t carried out. But diplomacy is not what Jewmerica wants. With Kerry blaming Russia for the violence Kiev is inflicting, and Ashton stating that “Kiev’s legitimate use of violence needs to be respected,” diplomacy is not in the cards. Putin won’t be backed into a corner. He received Crimea without firing a shot. In warfare it’s called waiting for the enemy to flub up. A surgical operation—disrupting Kiev’s military communications is one possible action—or simply anticipating the unraveling of eastern Ukraine, Putin remains in control. WITHOUT A DOUBT, Jewmerica is NOT interested in diplomacy BUT rather to pull Russia into a war with Kiev to justify a Nato installment in Western Ukraine. Putin is not so dumb to fall for that. NEXT UP … New Vid Coming Soon! Why are the Western presstitutes silent on this? Because their lords and masters are ball deep in the Jew agenda and do not want to bite the hand that feeds. Putin has displayed exceptional personal fortitude in the face of such blatant manipulations and provocations that he ought to be accepting the Nobel Peace Prize after they rescind Obama’s rank awarding of something he has no legitimate claim to. Obama was awarded the Prize for being a Black (sort of Black) president, he has done zero to further world peace, quite the opposite in fact. He is not worthy of even the term commander-in-chief, he is a puppet-in-chief. Ukraine’s battlefield: Slavyansk, Kramatorsk, Odessa attacked by Kiev’s forces. Surely not even those bent minds are stupid enough to engage Russia in any manner other than indirectly indirect. They’re playing into his hands like amateurs. Its embarrassing. Its like watching a kid try and hogtie an Elk with a shoe lace; now if Angela, you would just put your finger on the overhand hitch while I butterfly the loops, we’ve got him. Journalists at RT, who by their own admissions were young, ambitious and stupid. No doubt they came baring gifts, and with an appeal of Patriotic duty, a comment on their Star like qualities, a wad as thick as an Anaconda, and a conspicuous bulge under the left breast pocket) to take it right back at them; and in the nick of time too. The man Putin is a hero. While the consensus tranced zombies seek a human flesh buffer as ambulant insomniacs, I’m actually starting to relax and getting some sleep again. America wants war, simply because it needs a distraction from its economic collapse. At the moment Putin is looking extremely weak. He and his administration have said repeatedly if Russian speakers are killed there will be horrible consequences and so far nothing! If he doesn’t do something and quick, Russia will be next. The Ukrainian troops do not like the usurpers in Kiev anymore than the East Ukrainians do. They know who the Right Sector and neo-nazis are within their ranks. Watch out for fireworks. I have asked about 10 Russians the last months what they think of Putin. 9 out of 10 simply say he is crazy and they do not like them. Why? They never told me. Always a pleasure to read the truth. Indeed these lowest, most inferior beings are the most destructive, sneaky, tricky maggots humanity have ever seen! Thank God, Ukraine has Putin, Syria is being backed by Putin, and Rhouhani. Wise men. Versus Mexico, which is suffering horrible deaths under these Jack the Rippers, Hannibal Lecter phony empire. They are maggots in the stomachs of nations. Once they are in the corpses start to get them sick, eating their interiors until it collapses. Mexico is another current Syria. Silently getting butchered. The current center of human sacrifices where little children are supplying organs to these maggots to sell it in the international organ market. Please search: NOTICIAS DEL NARCO and see the pictures. This will happen to the US, if US doesn’t awake. Jack the Rippers are so restless 24/7/365. Europe has over one billion people. Russia only has 140 million. American nukes are greater than Russia’s nukes and I don’t see how anyone would use them. Russia has much to be concerned with. 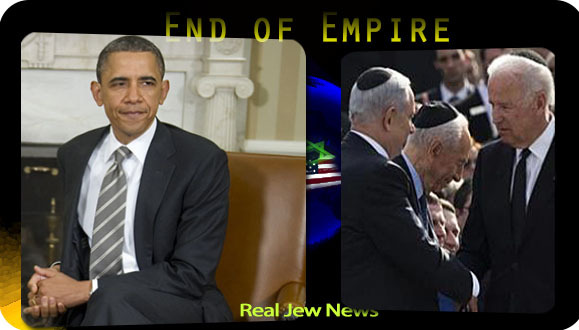 The Jewish banker-controlled West is not afraid of a long drawn out war with Russia that will wear Russia down. In fact, they probably like the idea — Europeans dying while killing Russians. If China stays out of it, Russia will most likely be defeated, unless there is a revolt among the West’s population. That means nothing. I know somebody personally who likes Obama, even though he is the most hated president ever. As things (our life and civilisation) comes to an end, then the devil goes round as a roaring lion seeking he will tear apart. As he (the Devil) has many followers, mainly paid with dollars, in the end this will all be totally worthless. The money and the lives of Devil, demons and wicked will burn with an inextinguishable fire out of their body. Let Rodina, her People and President Vladimir Putin be Blessed and receiving our pray for justice and wisdom in all their lives. I think Europe and Russia were building up a natural economic synergy that would be good and creative for both sides. Meanwhile, the US Regime is commanded by a Mafia mindset where wealth isn’t created, it’s simply taken. So, to keep in command the US Regime is actively destroying future development of Europe and Russia. To make the divide complete and impossible to reverse, the US Regime needs to induce Russia to intervene in Ukraine. To do this, the CIA is organizing its western version of Al Qaeda terrorists (in the form of Right Sector, etc) to create atrocities in East Ukraine. Once Russia intervenes to save lives, the US Political and Media mouthpieces will scream that Putin is a madman bent on rebuilding the Soviet Empire. And so, NATO forces will flood in and the “Iron Curtain” will fall again. And, the US Mafia regime will have destroyed any hope of Europe freeing itself from US Mafia servitude. Excellent article and what a scoop about the IMF’s veiled threat to “recalibrate” funding if Turchynov, as acting commander in chief, did not get an immediate grip on dissent in east Ukraine! 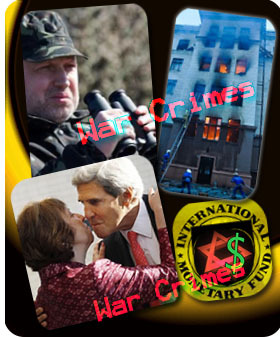 It clearly highlights the fact that the bought and paid for, illegal, “Kamikaze” Kiev regime of Yats the Yid, now pious Ukrainian Greek Catholic; and of evangelical pastor-interim president Turchynov has completely sold out Ukraine to the IMF, DC, Tel Aviv and Brussels and the interlocking directorate of predatory corporate crony capitalism. The resistance fighters defending Slavyansk in eastern Ukraine are armed with weapons identical to those in the hands of Ukrainian soldiers, and they are all citizens of Ukraine, the New York Times newspaper reports citing its own correspondent in Slavyansk. Self-defense forces protecting Ukraine’s eastern city of Slaviansk are equipped with old small-arms weaponry of the Ukrainian army, their commander claims there are no Russians among the activists, according to the New York Times. “Much of their stock was identical to the weapons seen in the hands of Ukrainian soldiers and Interior Ministry special forces troops at government positions outside the city. “These included 9-millimeter Makarov pistols, Kalashnikov assault rifles and a few Dragunov sniper rifles, RPK light machine guns and portable antitank rockets, including some with production stamps from the 1980s and early 1990s. Many of the weapons show signs of long service. “Militia members said their weapons had either been taken from seized police buildings and a column of captured Ukrainian armored vehicles, or bought from corrupt Ukrainian soldiers,” New York Times reporter, who spent a week at the headquarter of the 12th Company, part of People’s Militia of the Donetsk People’s Republic, wrote in an article Saturday. According to the interviewed self-defense activists, if Russian intelligence services were involved, they would have provided them with new arms. They also said local residents support them with food and necessary equipment. “To the guys in Kiev, we are separatists and terrorists, but to the people here, we are defenders and protectors,” Yuri, former Ukrainian paratrooper and a commander of the 12th Company, was quoted as saying. He added that the majority of self-defense activists have professional military experience. Southeast of Ukraine had been swept by pro-federalization protests since March. Earlier this month Donetsk and Lugansk regions have proclaimed creation of People’s Republics guarded by self-defense forces. Kiev’s interim government announced a special operation in a crackdown on federalists. Friday the country saw Friday the bloodiest violence since the February overthrow of President Viktor Yanukovych, with dozens killed in clashes across the Ukraine. The highest casualty toll was reported in the southern city of Odessa where 46 people died and over 200 were injured. A two-day national mourning has been announced in the country. Moscow had repeatedly rejected accusations that Russian troops are involved in unrest in southeastern regions of Ukraine. Both Ministry of Defense and Foreign Ministry of Foreign Affairs said that pictures and video demonstrated by Kiev’s authorities and allegedly proving the presence of Russian officers in Ukraine are fake. [The Jew York Times got burned big time trying to pass off the Russian Military-Photo Scoop propaganda photos received from the illegal regime in Kiev. This article may a truthful attempt to restore their crudibility with presumably on the spot, week-long interviews with east Ukraine people’s militias. The regular Ukrainian army units at the start of Turchynov’s campaigns arrived at their destinations very hungry, going several days without food, “making nettle soup” along the way. One of the things the people did was feed them. The NYT mentions that the 12th Company of the Donetsk People’s Militia bought a new RPG-7 launcher from Ukrainian soldiers for $2,000, along with 12 high-explosive projectiles. NYT: Western officials and the Ukrainian government insist that Russians have led, organized and equipped the fighters. The rebels of the 12th Company appear to be Ukrainians but, like many in the region, have deep ties to and affinity for Russia. They are veterans of the Soviet, Ukrainian or Russian Armies, and some have families on the other side of the border. Theirs is a tangled mix of identities and loyalties. Berlin (AFP) - Dozens of specialists from the US Central Intelligence Agency and Federal Bureau of Investigation are advising the Ukrainian government, a German newspaper reported Sunday. It said the agents were not directly involved in fighting with pro-Russian militants. “Their activity is limited to the capital Kiev,” the paper said. Fierce battles between Ukrainian soldiers and pro-Russian separatists in the country’s east have left more than 50 people dead in recent days. Kiev’s “anti-terrorist” operation in East Ukraine is in full swing, with dozens reported dead in the ensuing violence. Anti-government activists remain defiant and refuse to leave the seized buildings, demanding that Kiev’s troops withdraw. Coup-imposed Ukrainian interior minister Arsen Avakov said that after the ongoing military operation in eastern Ukraine, he intends to head for Odessa. “We will do our best not to let you down here (in Slavyansk). After we finish the business here – I will certainly go to Odessa. There is a lot of work. For everyone,” Avakov wrote on his Facebook page. Odessa’s new police chief, Ivan Katerinchuk, has addressed a crowd of Right Sector activists outraged at the earlier freeing of anti-government activists by the local police, RT’s Irina Galushko reports from the scene. Greeting the radicals with “Glory to heroes!,” Katerinchuk went on to tell the crowd that “separatism is illegal, unlawful, and so is its propaganda,” Galushko tweets. A crowd of masked Right Sector members and supporters have gathered at the regional police precinct to “get familiar” with the new chief. Katerinchuk, who is calling on the radical group to be “helpful and diligent,” is rumored to have been instrumental in Friday’s clashes in Odessa, according to Galushko. A dialogue between Kiev and southeastern Ukrainians is essential for resolving the crisis, Russian President Vladimir Putin told German Chancellor Angela Merkel over the phone. “Vladimir Putin stressed it is necessary to start a direct dialogue between the current authorities in Kiev and the representatives of the southeastern regions of the country,” a Kremlin press service statement said. Russian and German leaders have also discussed the issue of gas transit into Europe in connection with the recent three-party talks between Russia, Ukraine, and the EU in Warsaw. Swiss President Didier Burkhalter, the presiding chair of the Organization for Security and Co-operation in Europe (OSCE), is heading to Moscow on May 7 to discuss the situation in Ukraine, the Kremlin’s press service reports. Burkhalter’s visit was discussed between Russian President Vladimir Putin and German Chancellor Angela Merkel during a Sunday phone conversation. Merkel stressed the importance of international efforts in the de-escalation of the Ukrainian crisis. Authorities of the Donetsk People’s Republic have decided to form a regional regiment, the commissioner of the social-patriotic Eastern Front movement, Nikolay Solntsev, told RIA Novosti. He added that 800 people have already enrolled. According to him, the republic’s authorities previously began issuing permits to carry and use weapons. “People have already received such permits,” he said. There is no clear information on how the regiment will interact with the self-defense forces. Canada has imposed sanctions against 16 Russian banks and companies over Moscow’s stance on the situation in Ukraine. The US ambassador to Ukraine, Geoffrey Pyatt, has said that his country does not have evidence linking Russia to the tragic events in Odessa. It’s still Russia’s fault, no matter what. Russia can’t be an empire without Ukraine, according to the mad Brzezinski? Apparently not. RF special forces disguised as Ukrainians masterminding the unrest and discontent among the anti-Kiev protestors and activists of the southeast and organizing the self-defense units and militias? Scratch that. Ridiculous. Next it will be Russia’s fault because Putin is in his early 60’s, partially bald, has blue eyes and speaks Russian, in common with many of the southeast Ukrainian men. A great photoshopped political cartoon about Obama. JewAmerika is fooling the Russians as it is also fooling the whole World because it hasn’t any intention whatsoever in promoting peace in Ukraine, very much to the contrary. For JewAmerika the only purpose of peace talks is to gain time to put into place military assets so as to change the military balance to its advantage. The Russians, thus hesitating to come to the rescue of Southern and Eastern Ukraine have already lost much precious time. Putin should not have allowed himself to be blackmailed by baseless lies when peoples’ lives are being threatened by Western-backed murderous paramilitaries, but should have intervened militarily in Southern and Eastern Ukraine a long time ago. JewAmerika’s demonization of Russia is working in making Russia hesitant to act. Now the oppression which will be inflicted on the Russians in Ukraine will discredit Putin for failing to come to the aid of Russians and failing to protect Russia’s strategic interests. The time is approaching when Russia will either have to act to terminate the crisis by force or accept an ongoing crisis discrediting its government. Yet, the Russian government spokesman again expressed the hope of the Russian government that European governments and Washington will put a stop to the military strikes and pressure the Kiev government to accommodate the protesters in a way that keeps Ukraine together and restores friendly relations with Russia. In my opinion, this is a false hope. Putin’s patience is being tested. IMO, Russia, in case it is forced to use its military, will let the Ukrainian and N.A.T.O. forces move into eastern Ukraine, thereby exposing themselves and then encircle and capture the invading N.A.T.O. and Ukrainian army. I just wonder whether the captured N.A.T.O. forces will be held prisoner in Russia or moved to a neutral third party such as Switzerland, to be confined until hostilities cease. The USSA Regime is just as guilty of the massacre in Odessa as the illegitimate junta in Kiev and its criminal, terrorist forces in East and Southern Ukraine and must be prosecuted accordingly. The fact that this regime and its predecessor regime were not already prosecuted and imprisoned for their horrific crimes has led to the current situation in Ukraine. The UN has proven itself just as irrelevant as its predecessor, the League of Nations; neither has been able/willing to prevent major conflicts; the League of Nations having been unable/unwilling to prevent WWII. Therefore, it’s long time that the UN is completely revamped and its leadership replaced with true peacemakers, not frauds. The current Secretary-General, Ban Ki-Moon, is the worst fraud this institution has ever had. He’s done absolutely nothing to prevent conflicts across the globe; in other words, he has failed royally to do his job, and must be fired and replaced by someone who will do his/her job. In addition, NATO must be eliminated. Besides being an anachronism of the Cold War era that should have been eliminated simultaneously with the defunct Warsaw Pact at the Cold War’s end in 1990, NATO is no longer a security pact. It’s a criminal, terrorist syndicate in the line of Al-Quaeda that must be demolished; and, the European nations must be allowed/encouraged to form their own self-defense establishments. I have immense respect for Mr Putin when it comes to his gamesmanship. I just hope he is aware however that as canny as he plays it, eventually he will have to use the bigga badda booms button and that he is ready to get the first (and second) punches in on that score when the time is right. These wackjobs are playing for keeps, and they are not going to call it a day and decide they’ve done enough until they’ve got it all. Yes that about sums it up! It takes someone with God’s Grace to be able to stop them from starting WW3! Putin is beyond intelligent to fall into there trap! Now we have BRICS and we have the internet, there won’t be any Propaganda that brain washes people as the only form of journalism like the NY Times. The President of the Russian Federation received the White Book, a report prepared by Russia’s Foreign Ministry, which lists numerous facts of human rights violations in Ukraine in the period from late November 2013 to late March 2014. The document is based on information from Russian, Ukrainian and Western media sources, statements by representatives of the current authorities in Kiev and their supporters, eyewitness accounts and on-the-spot observations and interviews of Russian non-commercial organisations. The data in the report make it possible to assert that severe violations of the basic human rights’ principles and norms have taken on a mass nature in Ukraine. The main purpose of the White Book is to provide the public with facts and evidence of the events in Ukraine, thus helping to form non-politicised, unbiased assessments and to call to account those who are responsible for the illegal actions.